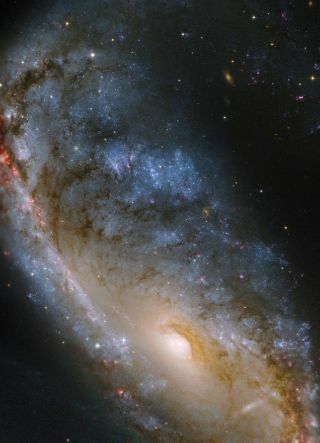 This close-up Hubble view of the Meathook Galaxy (NGC 2442) focuses on the more compact of its two asymmetric spiral arms as well as the central regions. The spiral arm was the location of a supernova that exploded in 1999. These Hubble observations were made in 2006 in order to study the aftermath of this supernova. A spiral galaxy with a dramatic lopsided shape is featured in contrasting views from two telescopes. The galaxy was imaged by NASA and the European Space Agency's Hubble Space Telescope, and the MPG/ESO 2.2-meter telescope at the La Silla Observatory in Chile. While the galaxy's lopsided appearance is thought to be the result of gravitational interactions with another galaxy at some point in its history, astronomers have not yet been able to positively identify the culprit. By comparing older ground-based observations, previous Hubble images that were taken in 2001, and these images from late 2006, astronomers have been able to conduct detailed examinations of what happened to the star in its death throes. By the time these images were taken, the supernova itself had faded and was not visible. The Wide Field Imager on the MPG/ESO 2.2-meter telescope took a much wider view of the Meathook galaxy that shows the double-hook shape that gives the galaxy its nickname. This picture of the Meathook Galaxy (NGC 2442) was taken by the Wide Field Imager on the MPG/ESO 2.2-metre telescope at La Silla, Chile. It shows a much broader view than the Hubble image, although less detailed. This view includes the whole galaxy and the surrounding sky, and clearly shows the asymmetric spiral arms. This broader image also captures several other galaxies close to NGC 2442, as well as many more remote galaxies that form the picture's rich backdrop. The ground-based Wide Field Imager can cover big sections of the sky in a single exposure. This, combined with the sharp images from Hubble in space can provide complementary information to astronomers. The different views also give a more complete picture of what is happening within the galaxy. ESO's observations highlight the other end of the life cycle of stars, compared to Hubble. Dotted across much of the galaxy, and particularly in the longer of the two spiral arms, are patches of pink and red. This color comes from hydrogen gas in star-forming regions: powerful radiation released by newborn stars disturbs the gas in the clouds they are formed from, making the areas glow a bright shade of red. The interaction with another galaxy that may have given the Meathook galaxy its unusual lopsided shape is also likely to have been the trigger of this recent episode of star formation. The same tidal forces that deformed the galaxy disrupted the clouds of gas and triggered their gravitational collapse.